Dog beauty starts with the correct product for your dog's specific coat and skin type. Understanding a specific dog breeds coat type can only be achieved by experts with years of experience. Unlike human hair, our precious pets come in different coat types, skin types, and coat lengths. The result is, an endless amount of combinations each requiring a specific treatment. Päsh experts know the science behind the correct shampoo's, conditioners and coat enhancers. We have incorporated processes to promote optimum vitality and well-being for your dog's hair & skin. We use very mild vitamin complex shampoo's ideal for sensitive skins or frequent bathing needs. Our hair products have relaxing properties creating a calming effect on the dog's skin. 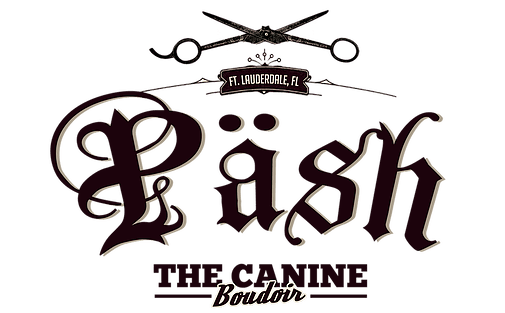 Using all natural sponges, Päsh offers exceptional spa like baths by thoroughly cleaning every strand of hair. The sponge allows us to clean 360 degrees without causing breaking or damage the dog's coat. Hydro-Surge bathing is a unique, effective and therapeutic solution to pet bathing. This bathing system uses a completely hands-free approach. By combining both water and shampoo or conditioner at the same time the specially designed nozzle exuberates the right amount of water pressure to massage the dog's skin while deep cleaning the dog's coat. Using proven methods, our certified master stylist's perfected the process of undercoat removal. We use specially formulated shampoo's and conditioner's specifically formulated for your dog breeds coat and skin type to help clean and safely remove both dirt and dead hair with minimal discomfort to your pet. To reach the maximum potential we finish the process with brushing, blowout & combing procedures using specifically designed tools for each breed coat. Many of our brushes & combs are supplied exclusively to Päsh by professional grooming suppliers looking to showcase their latest and greatest products. Specially formulated and designed to clean thoroughly, yet gently, without causing allergic reactions to your pet. Our formula is PH balanced using all natural ingredients, including Aloe Vera & select vitamins which produce a clean, healthy coat with a soft pleasant fragrance. Our oatmeal baths sooth, nourish & moisturize your dogs skin. This natural remedy is perfect for a dog experiencing discomfort from itchy irrated skin. We add a touch of epson salt to ensure relief. Providing a variety of effective leading shampoo's specifically focused on relief and management of dermatitis, bacteria, yeast & fungi. Our basic shampoo contains oat extracts producing an emulsion effect which eliminates dirt with maximum respect to skin & coat. An ideal dog shampoo for day to day use. A moisturizing shampoo with coat restoring properties that help recover the natural texture of the hair, leaving it beautiful & shiny. A volumizing shampoo adding nutrition to the dogs coat strengthening the coat & aiding in coat regeneration. A color enhancing shampoo specifically formulated for white, black and gray coats. Gently cleans while intensifying the natural color of the coat. Leaves the coat bright, healthy & shiny. Every hair on earth is made up of keratin. Due to age and chemical services keratin in your dog's coat is often lost. By using our Keratin Treatment we are able to add and put back keratin in your pet's hair. Proteins are found in almost everything. A protein is various molecules consisting of one or more chains of amino acids. Harsh chemicals and poor coat maintenance can break important bonding chains up. By using our Protein Treatment your pets coat will regain its bond resulting in fuller more healthy hair. A blueberry facial will cleanse exfoliate & brighten your pets facial features. Targeting tear stains and beard stains this all natural formula fights to really clean that face you love so much. It's calming blueberry scent eliminates the bad orders from your pets face. The blueberry facial also adds essential nutrients to your dog's facial hair using only natural ingredients, a win, win for everyone.